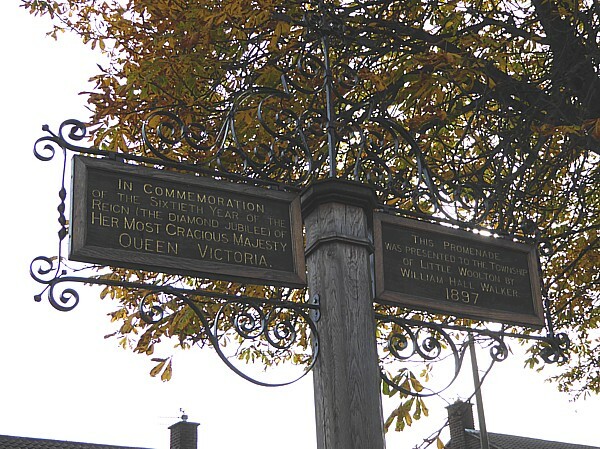 Which promenade does the sign refer to? 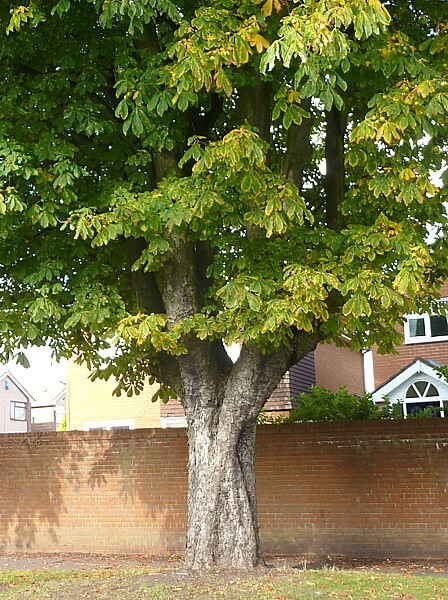 I think it means the row of Horse Chestnuts along the sidewalk, planted quite close together. Are there 60 of them, to match the 60 years of Victoria’s reign? No, I could only find 18, with possibly 8 gaps. But if they are related to the sign, they are 118 years old, which doesn’t look unreasonable because they have very thick, twisty trunks. 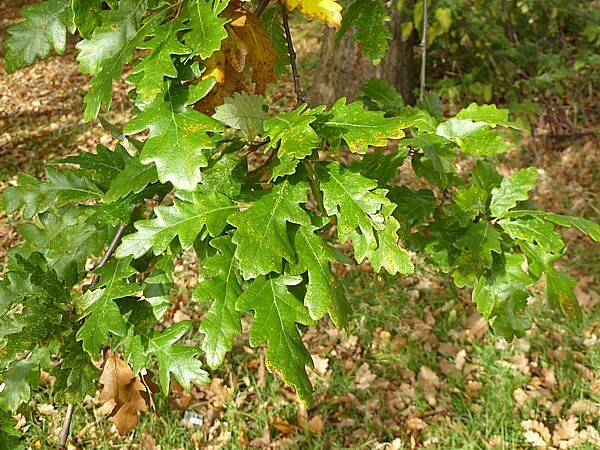 In the Recreation Ground opposite we noted a Turkey Oak, our Tree of the Day. 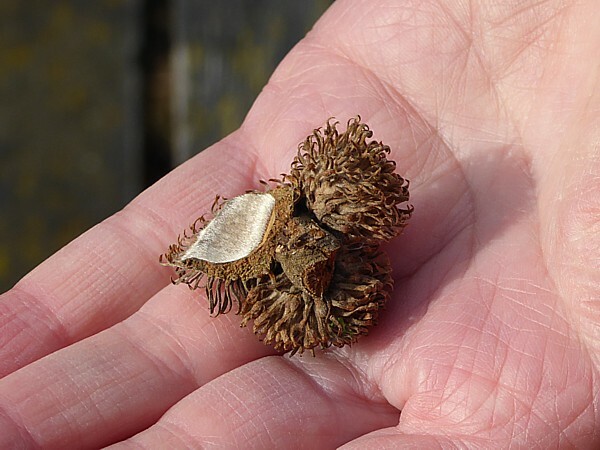 The leaves are hard to distinguish from Sessile Oak, but the “hairy” acorn cups are distinctive. There were a few late flowers along the trail – Hogweed, Buttercup, Red Campion and some Bramble. 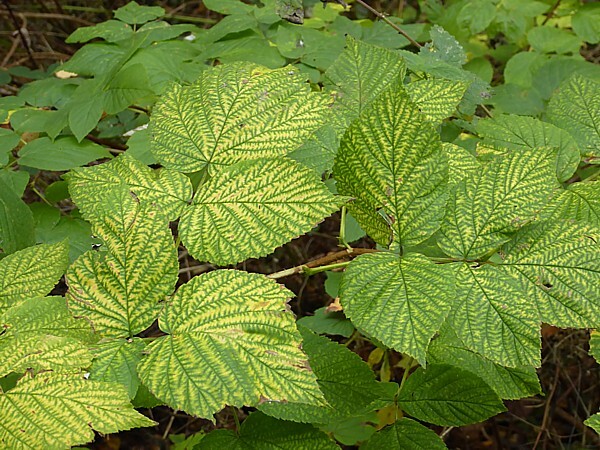 The leaves of one of the Bramble plants were yellowing between the veins in an unusually detailedpattern. Did the plant have a virus? There wasn’t much birdlife about. We heard Jackdaws calling, and south of Lydiate Lane we heard lots of harsh squawking. It wasn’t Magpies. Was it a Buzzard or a Peregrine? We had a brief view of what might have been a stooping Peregrine overhead (with that wings-pulled-in look), but it was probably just a Wood Pigeon. Another possibility was that it was a group of Ring-necked Parakeets. 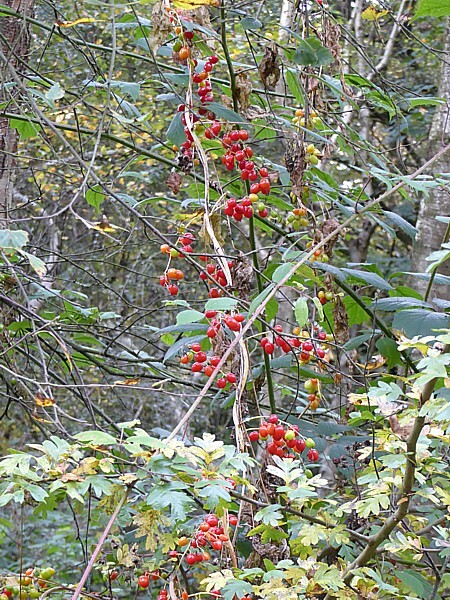 We peered into the undergrowth on that side of the path, but all we could see were the red berries on a vine of Black Briony. One section has some wood sculptures. 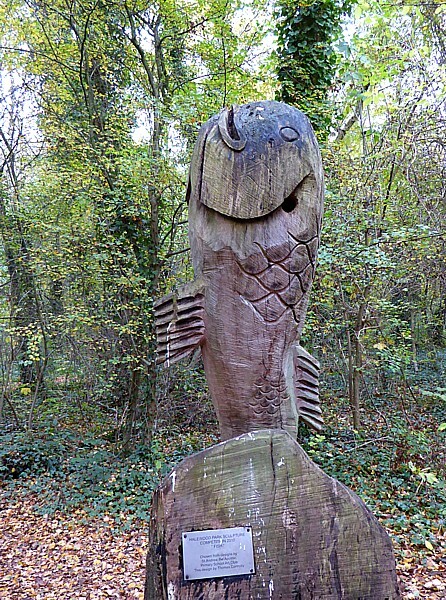 There was a Fox stalking an out-of-scale Hedgehog, a pert frog and this huge upright fish, with a woodpecker hole behind its gills. 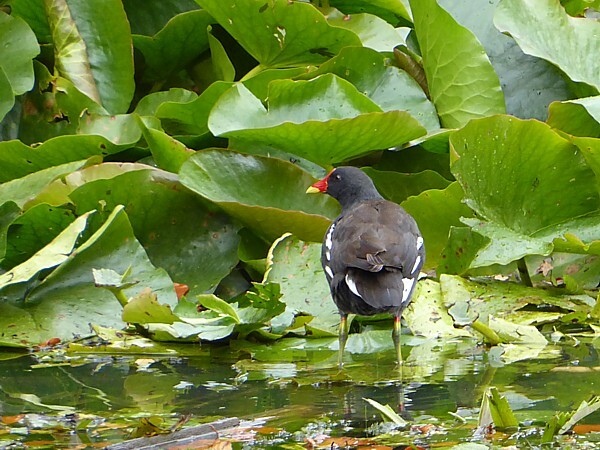 On the open meadow, there were Magpies and Wood Pigeons, but on the “Ducky Pond” there were just Moorhens and no Mallards at all. 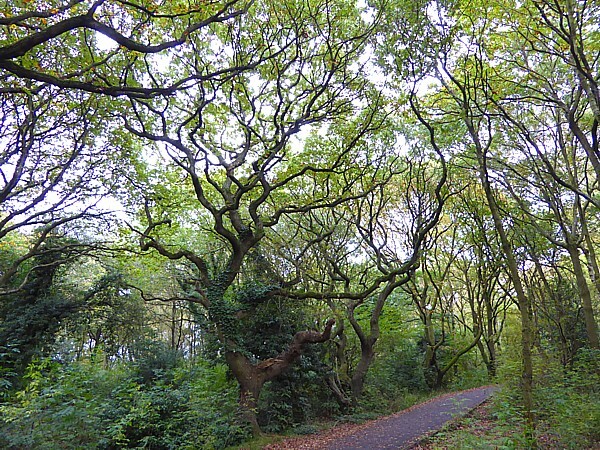 Today we did another 2 miles of the trail taking us to 25½ miles from Southport, the furthest we are going to go. 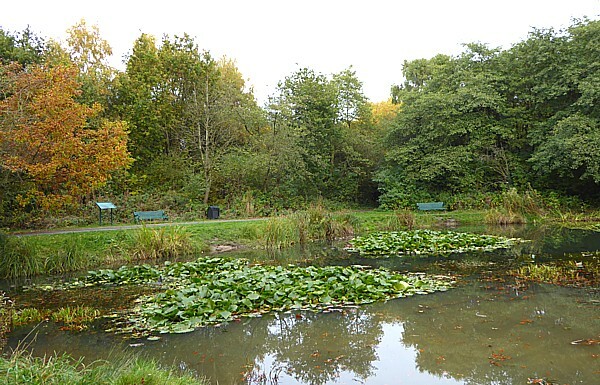 The next bit is along main roads and through Speke, an unattractive prospect for a nature walk. Public transport details: Bus 79 from Queen Square bay 1 at 10.06, arriving Belle Vale Shopping centre at 10.35. Returned from Higher Road / St Andrew the Apostle on the 75 bus at 1.55, arriving Liverpool, after much traffic congestion and a diversion, at 2.45.